Rarely seen today, this coin was among the first ever graded at PCGS and has the white label (before they changed to green). It is believed PCGS started with 108xxxx, so this was graded within the first 2000 coins. As of 1/27/2019, PCGS has graded over 40,500,000 coins! Description: Rarely seen today, this coin was among the first ever graded at PCGS and has the white label (before they changed to green). 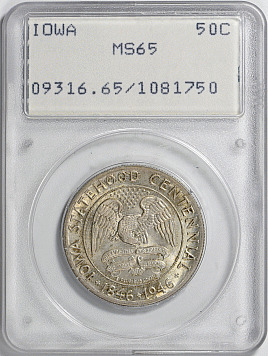 It is believed PCGS started with 108xxxx, so this was graded within the first 2000 coins. As of 1/27/2019, PCGS has graded over 40,500,000 coins!